Okay, once I found out that there are TWO (!!!) 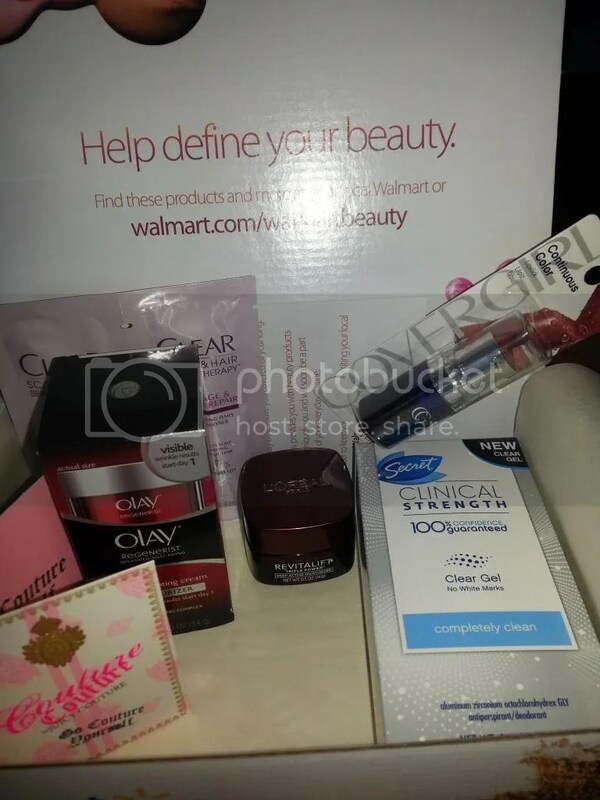 Walmart beauty boxes, which are apparently categorized into age groups (apparently age 35 and over received the original box about which I blogged last month), I registered my daughter to get the second option. And remember, this box is FREE. It comes out quarterly and all you pay is $5 shipping and handling. As you can see, just like the other box, it’s chock full of goodies. Let’s take a deep breath, wipe our sweaty little palms, and dive right in! 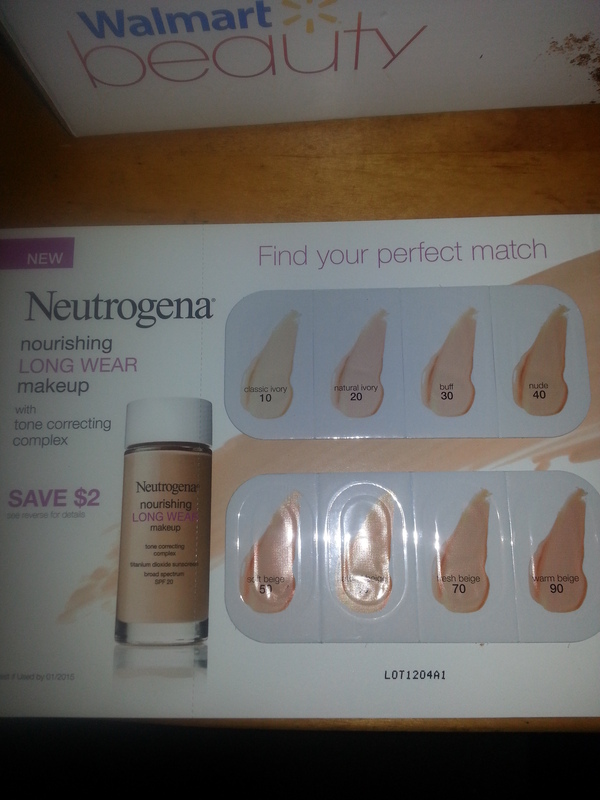 First up is this sample swatch card of Neutrogen foundation. Not very exciting but, hey, it’s free, so who I am to complain? Plus the card has a $2 off coupon in case you want to purchase the foundation…which my daughter does want to do. So far, so good. 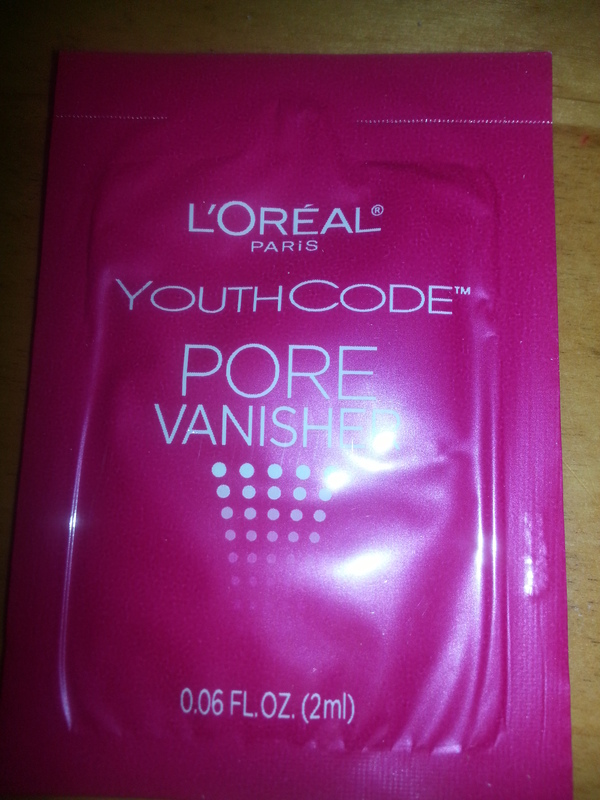 Next up is a sample of L’Oreal Youth Code Pore Vanisher. My daughter had just been saying she wanted to try a product like this, so she was delighted to see this in the box. 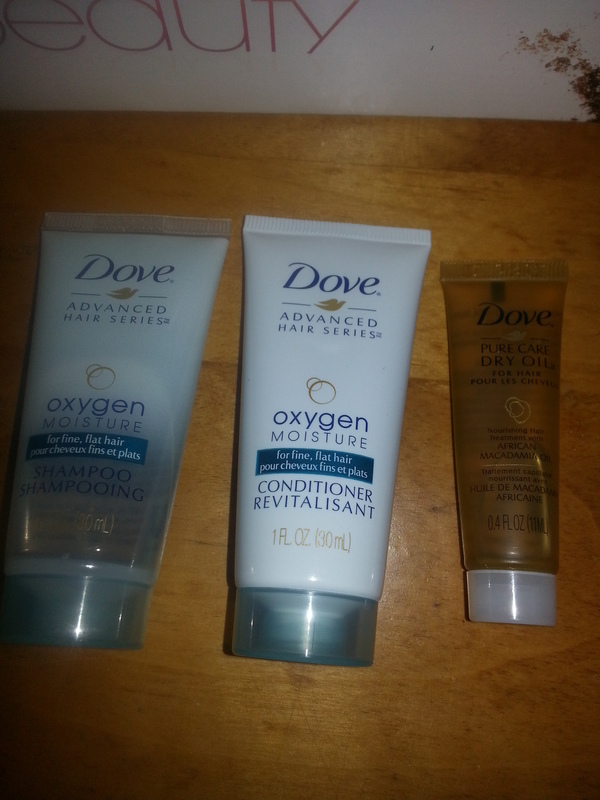 Next up is a trio of Dove haircare product samples, their Oxygen shampoo, conditioner, and a dry oil treatment. My daughter loves Dove products and had been wanting to try all 3 of these, so it was a banner box for her (guess Walmart knew what they were doing when they developed 2 boxes for different age groups, WTG Walmart!). 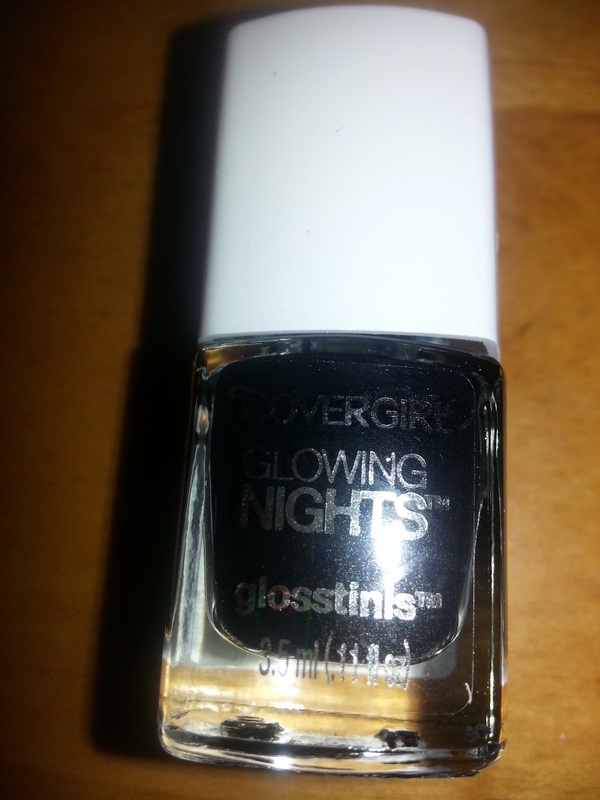 Next up from Cover Girl is a full-sized Glowing Nights nail polish in #laserlight. Again, my daughter was practically giddy when she saw this little gem! And yet another full-sized product, this time a L’Oreal Glossy Balm in Ginger Candy. And by this point my daughter has forgotten her disappointment with not getting the Black Dahlia lip tar in the Glossybox and instead is marveling over the perfection of the (free) Walmart Beauty Box! (And I freely admit I would steal this product from her in a heartbeat because it falls into my personal lip color preferences). Next up in this box we have a sample vial of the Pink Friday fragrance by Nicki Minaj. I have never smelled this and have no idea what the fragrance is like, but my daughter is willing to take one for the team and give it a shot…or, a spritz. 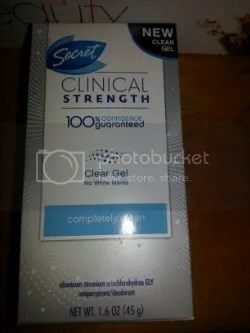 And the LAST item in the box is a full-sized Secret Clinical Strength deodorant solid stick. 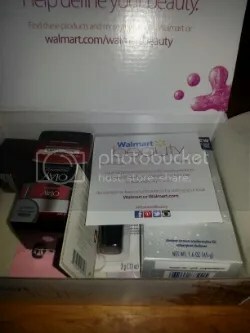 Here again, my lovely daughter is all atwitter because she was going to buy deodorant today but now, thanks to the ingenuity of this Walmart Beauty Box, she no longer has to (not really doing retail prices on these items because the box is FREE but this deodorant retails for a couple bucks more than the cost of shipping of the whole box). And there we have it, my lovelies. Yet another winner from the folks at Walmart. My daughter is just as happy with her free box as I was with my Olay-product-based box about a month ago. Great products that will most assuredly be used and a value that can’t be beat by any other subscription box. As always, feel free to follow me on the following social media…And don’t forget to ENTER THE BIG OCTOBER BEAUTY GIVEAWAY THROUGH THE RAFFLECOPTER LINK BELOW!!! Lots of items are still to be added and Sneak Peeks will be coming through regularly, so subscribe to the blog to make sure you don’t miss that “must have” item that’s been included. 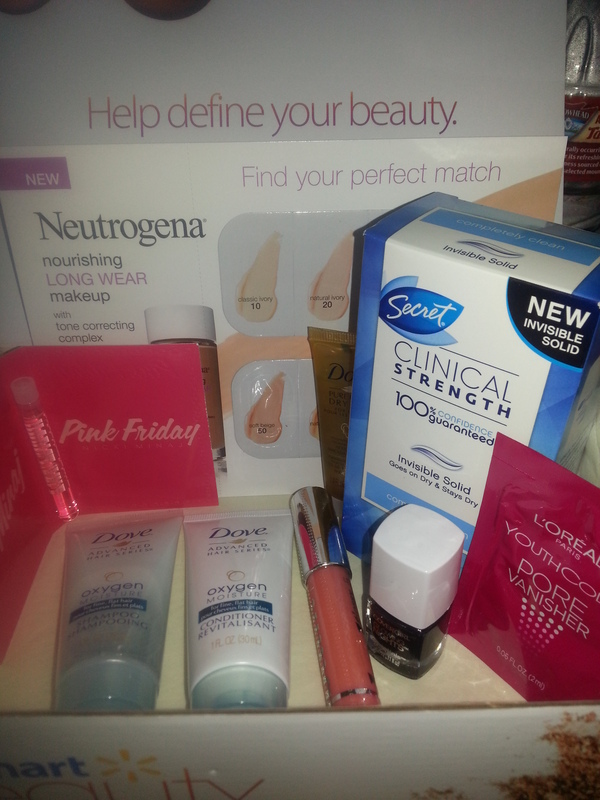 WALMART BEAUTY BOX: AND IT’S FREE!!! 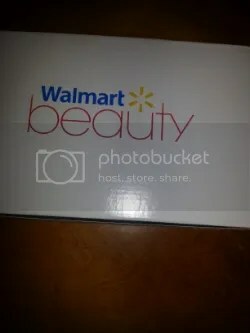 Well, imagine my surprise when I found out that not only does Walmart have a beauty box, but that that it’s FREE. Yes, FREE. For $5 postage, I wasn’t expecting much in return, maybe a few foil packets but, hey, what’s $5, relatively speaking? I signed up immediately, of course. Free is always too good to pass up. 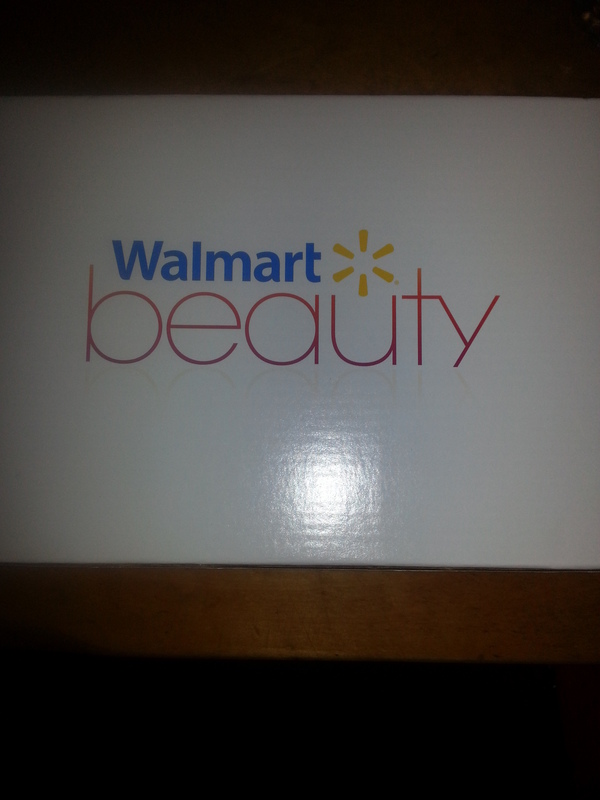 The Walmart Beauty Boxes come out every quarter. Once you sign up (which was amazingly simple and pain-free), you start receiving a box every quarter. I would assume by receiving my box in late September that I received a Fall box. My shipping information on my account never updated to “shipped” but showed “in process” the entire time (although I had been billed). Well, last night the little box of gems showed up in my mailbox, nicely wrapped in a small but very sturdy box. Opening up the box, it looks pretty much like any other subscription box, with an inscription on the top of the box and a layer of tissue paper between my prying eyes and the goodies therein. Now let’s get that pesky tissue paper out of the way and get to the important stuff…THE CONTENTS. Let’s see what our $5 postage netted us in return. Well, my oh my…This doesn’t look too bad at all. There are quite a few little goodies in here to sort through. Let’s pick a product and take a closer look. 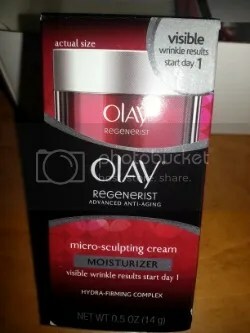 Olay Microsculpting Cream? Really? In a FREE box? And it’s a very decent 0.5 ounce sample size, packaged just like the full-size version of this product is. A quick check with my BFF Google tells me a full-size 1.7 ounce of this at Walmart is $23.94, which means this little beauty has a value of about $8. Okay, so this one sample is worth more than cost of the postage I paid. It’s all cake from here forward. 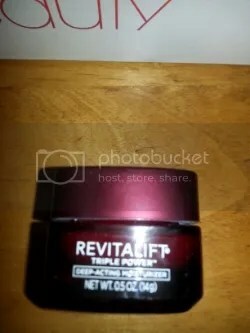 L’Oreal Revitalift Triple Power Deep Acting Moisturizer is the next product I pull out. It’s in a really heavy glass jar, another 0.5 ounce sample size. Google informs me a full size of this product (1.7 ounces) sells for $19.97 at Walmart, so this little beauty is worth a little over $6. Total value so far is around $14 and there are still plenty of goodies taunting me in this box. 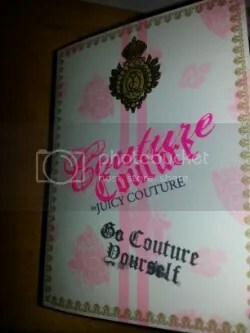 Next up is a sample vial of Couture Couture by Juicy Couture. Imagine my surprise. I didn’t even know Walmart sold Juicy Couture fragrances. Great fragrance that I hadn’t sampled before, so I was delighted to get this. Okay, color me surprised…or color me Vintage Wine, I should say, as least my lips. 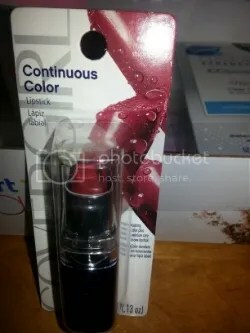 Here’s a full-size Cover Girl Continuous Color lipstick. 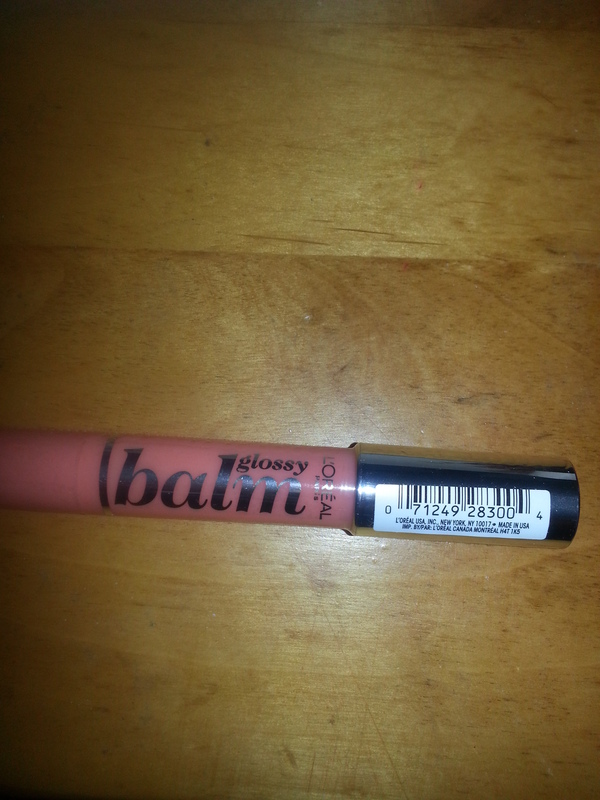 Although I couldn’t find this particular color on the Walmart website, I did note that this product sells for $4.94. So far the value of this box is adding up quite nicely…Moving right along. 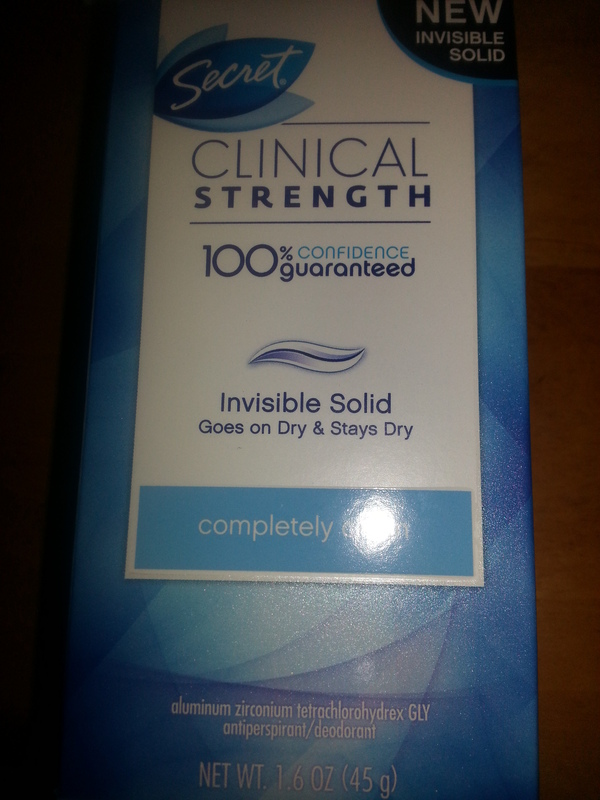 Well, here’s the big ticket item for me in this box…A full-sized Secret Clinical Strength Deodorant. Secret is the only brand I buy and I haven’t yet tried the clinical strength, so this is really a welcome addition to the box. Bonus points for this being the clear gel formula…no pesky white marks. This baby sells for $7.92 at Walmart. To quote Charlie Sheen, WINNING!!! 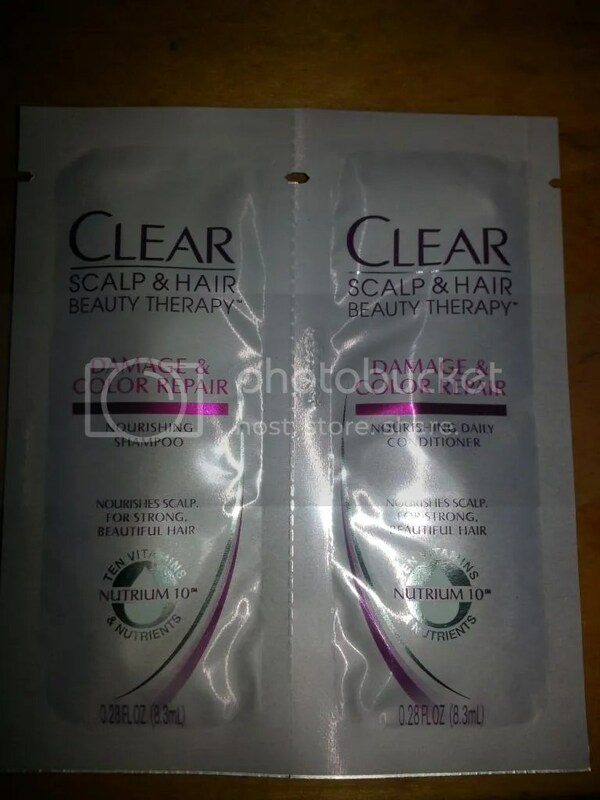 Next is a foil packet sampler of Clear Hair and Scalp Therapy, the damaged hair version. I had actually gotten samples of this about a year ago and, as I recall, I loved it, the way it worked and the way it smelled. Now I’m wondering why I never remembered to actually buy it. Perhaps these samples will refresh my memory as well as my hair. And there it is. 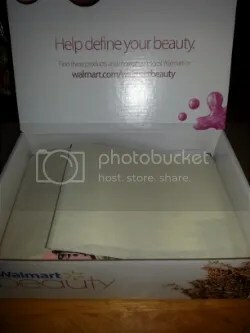 The Walmart Beauty Box Fall edition, with a retail value of around $27 for FREE, just $5 shipping and handling. Was it a deal? You betcha. Heck, the deodorant alone is worth more than the cost of the postage and to get all of those other goodies along with it? Icing on that proverbial cake. Here is the link to get you started if you’d like to grab one of these boxes for yourself. I’m really glad I did! Until next time, stay beautiful…and keep watching for our big October GIVEAWAY…You don’t want to miss that one!